Chad Kackert was the difference maker in the Argonauts’ 45-31 victory over the Hamilton Tiger-Cats on Saturday afternoon at Rogers Centre. The second-year import, starting running back recorded 172 yards rushing and three touchdowns in the impressive Argonaut victory. Kackert was also a prominent playmaker in the Argonauts’ passing attack as he registered six receptions for 67 yards. The Argonauts’ defence set the tone on Saturday afternoon at Rogers Centre. Argonauts’ defensive tackle, Armond Armstead opened up the football game with a sack on Ticats quarterback, Henry Burris. On the Argonauts’ first offensive possession, Ricky Ray orchestrated a three-play, 63-yard drive, culminated by Chad Kackert’s first rushing touchdown of the game. The Tiger-Cats would respond shortly after as Luca Congi converted a 48-yard field goal attempt cutting the Argonauts’ lead to 7-3. 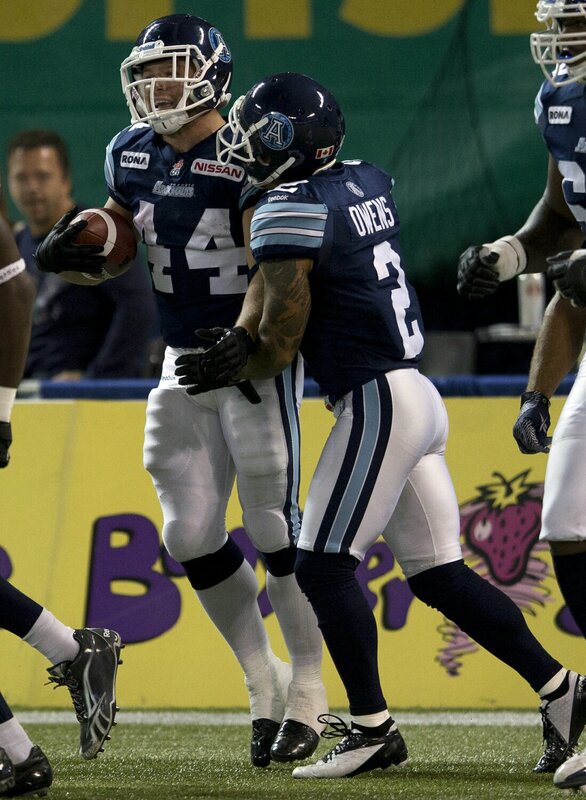 On the ensuing kickoff, the “Fly’ in Hawaiian”, Chad Owens put the Argonauts’ in tremendous field position with an incredible 66-yard return. A pass interference penalty would move the Argos into the red zone where their drive would stall and result in an Eric Wilbur 16-yard field goal. Wilbur made his Argonauts’ debut on Saturday afternoon, replacing injured kicker, Swayze Waters who was absent due to a neck injury. Ticats kicker, Luca Congi was a perfect 3-for-3 on field goal attempts in the football game and managed to keep the game in reach for much of the first half. Argonauts’ cornerback, Pat Watkins recorded his fourth interception of the season in the second quarter of the football game and returned it 27 yards for the first pick-six of his CFL career. Watkins is currently tied for the league lead in interceptions with Eskimos cornerback, Joe Burnett. Tiger-Cats quarterback, Henry Burris has now thrown four interceptions against the Argonauts’ so far this season including two returned for touchdowns. Late in the first half, Chad Owens surpassed Dominique Dorsey for 12th on the CFL all-time return list. Owens entered the game 92 yards behind Dorsey and concluded the game with a total of 160 return yards, propelling him ahead of the legendary return man. Former Argonaut, Dee Webb recorded his first interception of the season in the third quarter on Saturday afternoon. Henry Burris would generate points off of the turnover as he connected with Samuel Giguere for a 45-yard touchdown. The big-play was the first touchdown reception of the season for Giguere and put the Ticats back in striking distance as Hamilton was trailing by just three points midway through the quarter. The Argonauts’ offence seemed to be firing on all cylinders on Saturday afternoon and they responded to the Tiger-Cats touchdown with one of their very own. Jarious Jackson recorded his second touchdown of the season as he plunged into the end zone from the Tiger-Cat one-yard line. The Argonauts’ took complete control of the football game in the fourth quarter as Chad Kackert recorded his second touchdown of the game on an 11-yard run. Kackert added another touchdown later in the quarter on a sensational 39-yard rush. The Tiger-Cats recorded two late touchdowns from Andy Fantuz and Onrea Jones but it was not be enough as the Toronto Argonauts’ took round three of the “Battle of Ontario” and are sitting three games ahead of the Tiger-Cats for second place in the Eastern Division. Ricky Ray has recorded back-to-back 300-yard passing games for the first time this season. On Saturday afternoon, Ray was 26-for-32 with 331 yards passing and one interception. The Argonauts’ defence was solid when it mattered most as they held Henry Burris to just 46 yards passing in the first half and generated two turnovers in the football game. Argos’ defensive back, Evan McCollough led the way and recorded five tackles along with a forced fumble in the football game. The Argonauts’ special teams units did a phenomenal job of stopping Chris Williams in the return game. Williams was searching for his fourth consecutive game with a return touchdown; however, the Argos’ cover team held the reigning CFL rookie of the year to just five return yards. The Argonauts’ had major penalty troubles on Saturday afternoon as they were penalized eighteen times for a total of 257 yards. The 257 yards is a team record for most penalty yards surrendered in a single football game. Chad Kackert and his three rushing touchdowns are tied for second most in a single game in Toronto Argonauts history. The last player to reach that feat was Michael Jenkins in 2001.